New Sidewalks Near Lewis Elementary, a photo by timlauer on Flickr. 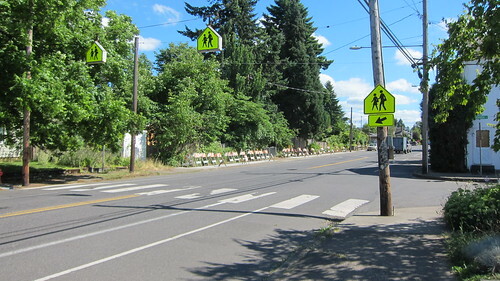 Last week, the City of Portland began work on the construction of some pedestrian improvements near Lewis Elementary School. Sidewalk installations have begun on SE 45th avenue at locations that previously did not have sidewalks. This includes a section of sidewalk directly north and south of our crosswalk on SE 45th and Evergreen. In addition it looks as if a pedestrian island is being installed at SE 45th and Glenwood, and a section of sidewalk is being installed just north of Glenwood on SE 46th. These improvements will make it easier and safer for students and their families to walk and bike to and from Lewis.